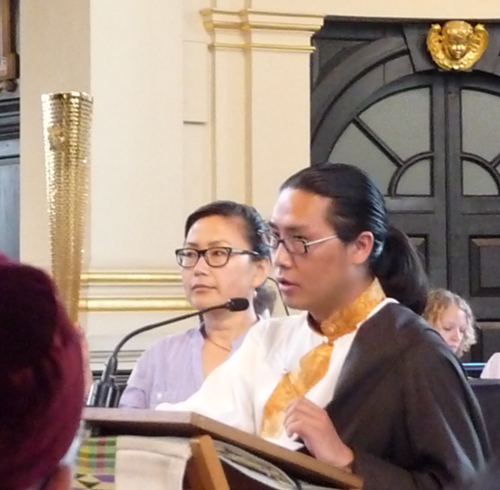 A special service to mark the opening of the London Olympic Games 2012, which the World Congress of Faiths working with St Martin in the Fields arranged on the theme ‘Go for the Golden Rule’ took place in London on Sunday 22 July. The Golden Rule is to be found in many religions and essentially follows the maxim, “Treat others how you wish to be treated”. This fundamental moral ethic is found in most religions and cultures and used throughout the world to resolve conflict. The very moving and inspirational service had representatives from ten different faiths give readings of the Golden Rule as it applied to their respective beliefs. Tibet Society was invited to take part in the service by the World Congress as it was felt important that Tibet and Tibetan Buddhism was represented at the service especially since Tibet is excluded from official Olympic events. The service began with a group of children from different faiths carrying a London Olympic Torch (probably the first to reach central London, albeit unlit!) to the front of the church to an affecting accompaniment by the choral scholars of St Martin-in-the-Fields singing Benedictus from “The Armed Man: A mass for peace” by Karl Jenkins. The Torch was passed from faith to faith throughout the service. 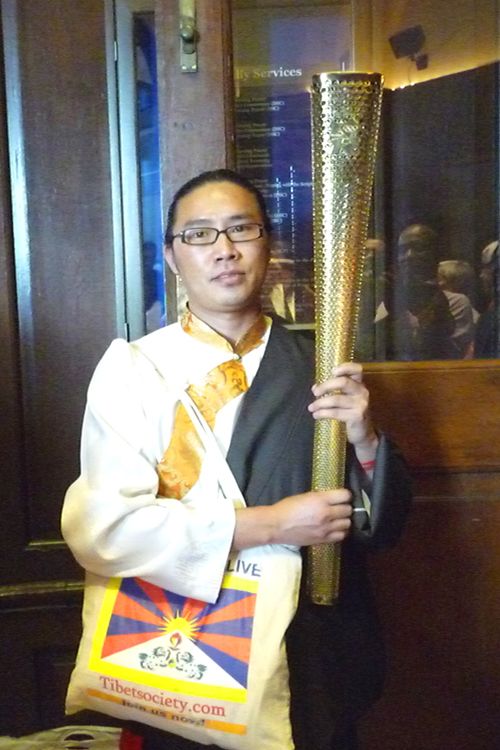 Whilst these were being read, the Olympic Torch was held by Tseyang Dolma from Tibetan Youth UK. Later Karma also had the opportunity to hold the Torch aloft. The Olympic Games were originally linked to a religious occasion and were also originally accompanied by a truce. This service gave everyone a wonderful opportunity to come together to pray for justice and peace throughout the world and to express hope that the Olympic Games will be a model of how nations can strive together for the good of all people. In his address, Geoff Thompson, five times World Karate Champion in the 1980s, reiterated how sport can bring people together saying that sport is an intercultural language of youth and can inspire a new generation to make a better world. The World Congress of Faiths was founded in 1936 by Sir Francis Younghusband who had led the British expedition to Tibet in 1904 that turned into a de facto invasion. Following a mystical experience when retreating from Tibet, Younghusband came to regret his actions. In 1933 in an address to the second World Parliament of Religions he said, “Out of the very agony of war and out of the despair of economic problems we have, of set design, to make good come. Otherwise, we shall be no worthy agents of the World Spirit”. Three years later he established World Congress of Faiths. The Congress has four patrons including the Dalai Lama and Desmond Tutu and is a fellowship of people of different faiths who seek spiritual enrichment by mutual sharing of beliefs and practices. It believes that understanding between people of different religions is important for good community relations, for moral and spiritual renewal and for world peace.